Lips zipped and turned up at the ends. 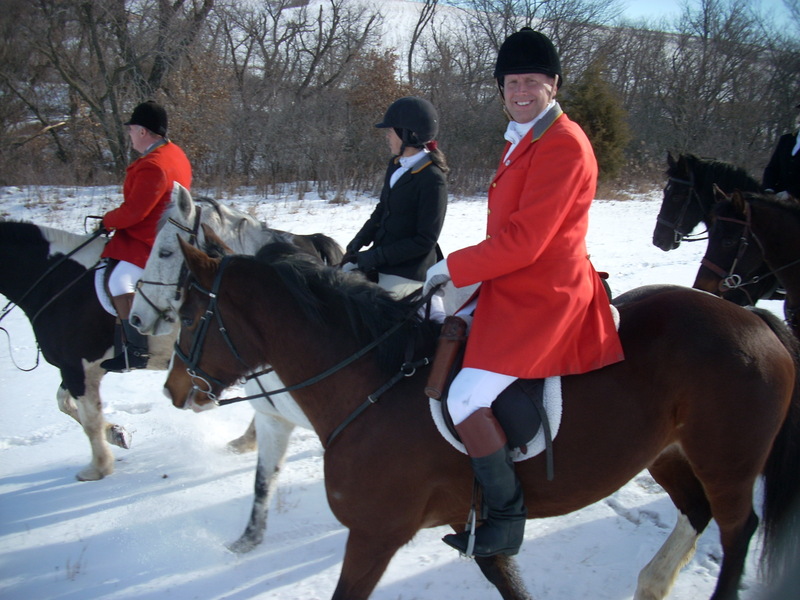 Jay and Sangha enjoying a foxhunt. Notice no one is nitpicking Jay. This makes the happy part possible. Once upon a time there was a young couple, very in love, who had three young boys. Regina and Beuregard (‘Bo’ to his friends) led active, fulfilling lives during the day – she, raising her boys full time, except for one hour a day when they went to a sitter and she went riding; and he being a symphony maestro, and sometimes getting a golf game in. They each were very happy; and evening meals were filled with lively conversations of the events of the day. Christmas came, and the boys asked for fabulous, noisy boy stuff and Regina and Bo pretty much had everything they needed, so they decided to treat each other to lessons in each other’s respective passtimes. She would take golf lessons and he would take riding lessons. It was a splendid idea. She met the golf instructor, learned about proper grip on a club, which clubs to use when, what clothes to wear, golf etiquette and more. She started to understand why her husband enjoyed golf. She couldn’t wait to golf with him. Meanwhile, Bo’s riding instructor was introducing him to the world of horses. He learned about leading and grooming and walk, trot and canter. Somewhere in there he started to see the beauty that his wife saw in horses. He couldn’t wait to go riding with her. They went out to the links first, on a beautiful summer morning. They walked out to the first tee and she set her ball on the tee, reviewed all the things her instructor had said, and teed off. It was an ok shot, straight, but not far. She was delighted. From behind her, where he was placing his tee in the grass, he couldn’t see her happy reaction, and said, “You’ll get more distance on that if you slow your backswing.” Her smile faded. The day of their ride together came, another pretty summer morning. As they were tacking up, he was congratulating himself for successfully identifying the correct horse from the herd of 40. He had led him in, found the right tack, and after grooming (picked all four feet on the first try! ), put the saddle on. He was chuffed. She had tacked up in the same time, and came over to take a look at how he was doing. “Oh, you need to put these these leather ends in the keepers on the bridle. And the elastic end of the girth should be connected to the left billets, not the right.” His chuffness wilted. As a result of their partners pointing out only the negative, riding and golfing together became unfun. Human nature dictates that we notice things. The cave men who noticed that the saber-toothed tiger lived in that round cave over there, influenced the group to build their houses in the square cave over here. They lived, reproduced and created more little cave people who were taught and genetically-programmed to noticed things. The tribe that didn’t notice things and tried to live in the round cave over there proved to be quite delicious and consequently did not reproduce. Noticing things, sharing information and acting on it served cavemen well. And we are descended from millions of years of observant survivors. However, that survival approach – to notice and communicate about everything amiss – doesn’t fly well in all situations. If you are the more experienced one, your job is to see all; and comment only on the positive or the imminently fatal. Having witnessed and experienced the allegory of Regina and Bo, when my husband began to ride, I decided, nay committed, that I would learn from their fail – I would follow the ‘positive or imminently fatal’ rule. In every situation where I wanted to say anything that wasn’t positive and encouraging, I put it to the test. Is this situation imminently fatal? Yes. Then speak. No? Zip lip. Seriously. IMMINENTLY fatal. The trick to helping people you love learn a skill you know already is to notice all, comment about the positive and be gentle about the negative, in other words, fight the human tendency to comment on the negative, even under the tricky guise of “improvement”. Never underestimate the possibility that the other person may be justifiably delighted with the result they achieved. Mostly, keep the lips zipped and turned up at the ends. Do the horse and rider in this picture look confident and happy? 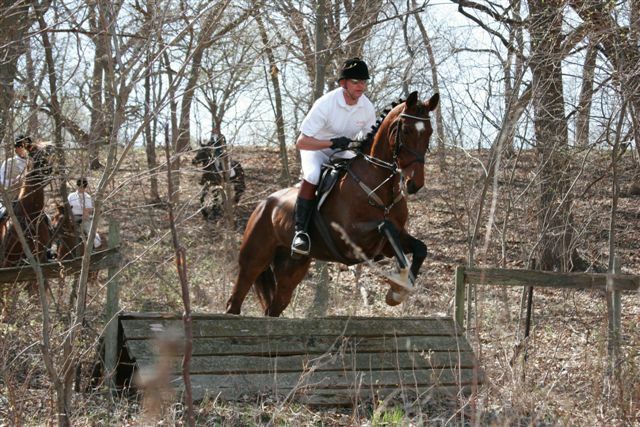 The riding in this picture is mostly a result of me keeping my mouth shut. Now, a word about teaching men in particular. I can’t tell you how many of my riding girlfriends have tried and failed to teach their husbands to ride. Some failed because of the above nit-picking and others failed because they didn’t perceive the difference between how men and women (as a general rule) learn. Men are not simply women with short hair. They are the turf racing to your mud track, the arabian to your quarterhorse or whatever. They’re different than us. Deny it and suffer.Get it and be happy. 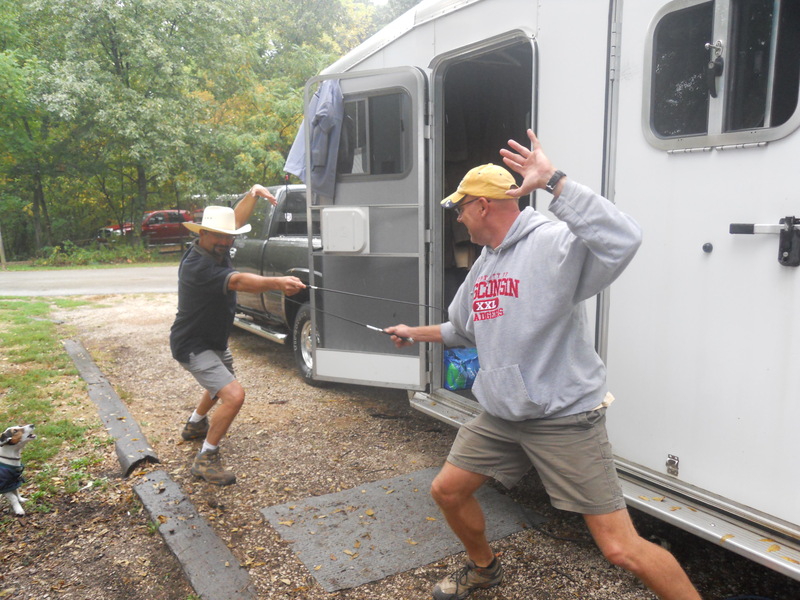 What two men will do when they are each given a dressage whip. Men have a very high play drive. They want to just do. They tend to throw away instruction manuals. You know this, so here’s how to work with it. When we talk theory or drone on and on about connection or “sending the energy” we lose them. We have to teach them backwards compared to how we teach a group of women. (Generalization alert) Women want to understand the exercise before beginning. They want to understand the why. Men want to do and experiment. So, for a group of men, I set up exercises that are relatively safe, but will show clear success or failure. Cavaletti bounces are great (4 in a row set 10′ apart, 6 inches tall, or if true beginners, poles on the ground). Looks easy, lots of potential for success or relatively safe failure. Whatever the exercise, when men are successful, they tend to be happy and look for the next challenge, and if it is a group that knows each other, maybe they’ll talk a little smack. Fun. When they fail, they tend to look for the reason and how to improve. Both are really good results. A successful ride produces confidence. An unsuccessful but not seriously scary attempt produces a desire to know how to do it better. When that happens, you’ve got a laser-engaged student. You didn’t have to chase him around, you didn’t have to shout, you just got it handed to you because you let him experiment. Let the exercise do the teaching and it becomes easy to keep the lips zipped and turned up at the ends.